If you are joining me today from Proverbs 31's Encouragement for Today welcome! I’m so glad you are here. Why is it so hard to think good, noble, excellent, praiseworthy thoughts (like Philippians 4:8 tells us) when not-so-good and not-so-excellent words are hurled my way? Harsh words. Sarcastic words. Mean words. Sometimes those words burrow painfully under my skin, like the time I got a splinter while leaning over a quaint wooden bridge to enjoy the view. It sure wasn't what I expected, but there it was, its jagged edge painfully protruding out of my flesh. I’ve learned that if I don’t remove the splinter, it absorbs all of my thoughts. Everything I do will be affected by the splinter and my need to protect it. Until I get the right tool (tweezers), the splinter remains lodged, and I can’t stop thinking about it. That’s how it sometimes works when an unkind word pierces our hearts. Mean words can lodge into the deepest part of us, creating a furrow that our minds consistently retrace, and holding our thought-patterns hostage. In spite of our best efforts to shake it off, it can feel like our minds have a mind of their own as the incident replays in our brain. It’s not until we find the proper tool—in this case, prayer—that we can dislodge the painful splinter-words. Through prayer, we find grace to forgive and Christ’s healing for our wound. Through prayer we are equipped to think about whatever is good, noble, excellent, and praiseworthy. So instead of having minds with a mind of their own, through prayer we can have the mind of Christ. And that, sweet friends, is an excellent thought. 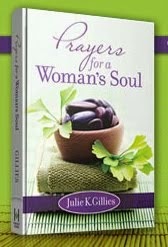 I’ll be giving away 2 signed copies of my new book, Prayers for a Woman’s Soul to 2 different readers. Just leave a comment sharing the area in your mind you struggle with most. I'll pray for you and will randomly select a winner that I'll announce on Tuesday. And if you haven’t already, be sure to sign up for 5 Days of Extravagant prayer. You’ll receive a FREE chapter from my book daily via email for 5 days! My husband hurls hurtful, destructive, divisive words and actions my way and in front of our children. I then hear the same hurtful messages and words from my step-daughter as she “hates” me and my children. What I thought was going to be a wonderful opportunity for two grieving families who lost parent and spouses to cancer with very young children left behind has been – well – words really can’t describe. My husband has hurt our family and I wake up every morning full of hurt and regret. Thank you, I know I need to let go of the daily bashings but it is so difficult as I end up in a place of remembering when, when life was so precious and my husband and I were adopting our two kids and building our dream home, before God called him home. Thank you for this timely, encouraging post. I fortunately have been blessed with a very loving husband. He's just recently been diagnosed with prostate cancer and I'm plagued with worry and fear at times. It's hard not to imagine the worst sometimes. I pray and then try to give it to God, but find myself in the mire of worry again. God is good and I know he has a plan for our lives. Julie, thank you for your ministry. I deal with continual thoughts of insecurity in my marriage and need to flee from the lies and stand in His presence minute by minute. Today is a new day - may i walk in victory as i remember your words from His word. My mind is out of control most of the time. Whether I'm upset b/c my husband doesn't love like I want him to or b/c I'm overwhelmed with fear and worry. This was exactly what the Lord wanted me to hear today. Thank you! I am blessed with a godly man for a husband. My mind is often consumed with worry and anxiety for my daughters and granddaughters. Our youngest daughter is currently deployed with the US Navy. She left just over 2 weeks ago and her service to our country makes me both proud and terrified all at the same time. I also worry about my job and the work that I do not being good enough. I can be highly critical of what I do tending to expect perfection in everything. I loved your message this morning and will carry it with me. Thank you. I have a horrible time with worrying. Worrying about money, focusing on bad decisions I have made in the past, feeling as if things will never change. This is just what I needed this morning. Thank you! I was praying this morning and I was declaring that I give God all my worries as He said we should because I did not want my mind to be bombarded with the thoughts of my bills and debts. I clicked on P31 Devotions and there you were reinforcing what I was saying. Thank you for this devotion and the words. Thank God for using you to reassure us women. It is hard to turn my mind off at night. All my worries and insecurities surface and affects my sleep. I know what the Bible says about reigning in our thoughts it I'd just hard for me to apply it. Thank you for your devotion and your ministry to overcome this destructive mindset. I struggle with resentment. My husband has some health issues and he is on disability. I work a part-time (35 hrs/week) job, I'm a writer and I own an editing company. There are days when my husband is able to do small, simple things that would help me a lot, but he doesn't. I realize as I type this that it sounds very petty, but it's been going on for a long time, and I'm very tired. Please pray for me to have a mind-set/attitude change. I am also one consumed with worry, or unkind words that someone said to me. BUT at this time my greatest fear and concern is for my husband who is facing surgery because of a lesion / tumor on his lung. He is a tower of strength for us all these years, a gentle gentleman and I need to hold on to and dwell on trusting that our Lord is in control of this situation we are going through. I struggle with assigning meaning to my husband's actions that may or may not be true, and subsequently feeling very unloved by my husband. I don't know that he loves me the way that a godly husband should, but I don't think I ever give him the benefit of the doubt either. I struggle with worry and fear. My mind tends to go to the negative, the bad that could happen. I have trouble getting my mind to stay focused on God. I struggle with doubt, doubting myself, doubting God and his moves. I needed that devotional today because it said to me that He heard me. I'm constantly on the threshing floor praying and seeking God. this is just one area that really has a stronghold. Worry - Anxious about . . . . . everything! Even though I know I should be anxious for NOTHING! It is a daily battle - I was so encouraged to see your devotion and to learn about your book! I struggle with letting go of past sins that I know I have been forgiven. I struggle with worry over my husband's health and my sons addiction which also causes worry over finances and also with anxiety. I really needed this today. I woke up at 4:30, for why? WORRY, ANXIETY, STRESS you name it. I also have a husband who has been very very hard with his words for 10 years, although its getting better, over Christmas I finally found the courage to get my kids and myself out and actually left (he then spent Christmas Eve in a motel) but it was time I stood up for myself. Yes the words haunt you forever. I have now started my own business but I am terrified of failure so I don't go out and talk to people about my Nutrition Club (what if they say the wrong thing or say it the wrong way rejection). My husband was injured and is trying for disability, 1 1/2 years later we finally have an court date 3+ months away and I am on unemployment till my business takes off. More worry and anxiety. SO I am going to rewrite your prayer from my Proverbs 31 email and say it often. Thank you and Bless you for sharing your story. Please pray for my sister in law. She has lived a hurtful, painful life she is in need of prayer so badly. She replays all of these thoughts over and over and she knows it is not right, but cannot stop. Being in a blended marriage, I struggle with family issues. I struggle with anxiety and worry. This devotion was needed. I struggle with fear. Fear of making the wrong choice, fear that God doesn't want to heal me yet, fear of ruining my children, fear of neglecting my husband, fear of spending to much money. Thank you for reaching out to women like me. Like you, I also rehash my husbands faults, unkind words SMC have become consumed with resentment. And when I see my children picking up this behavior I feel like bolting out of my marriage. I pray God will help me forgive and find joy. I've read your blog before and was so excited you have a book out! I too struggle with negative thoughts towards my husband--when I first found your blog I knew we had a similar situation at play in our marriage. It's a long story but we are living in the same house again for the first time in 10 years and I am learning how to deal with the destructive pattern of my thoughts--something I thought I had a handle on. When we lived apart I could just ignore his words and the thoughts they provoked in my heart. Obviously, my Father desires more complete healing and freedom in this area, otherwise my husband would still be living in another state. Can't wait to receive the 5-day prayer challenge e-mails and hopefully read your book! I struggle with self centered thinking rather than Christ centered thinking or others centered thinking. I have released much if the anxious thinking I used to live in. I struggle with feelings that I am not good enough for God and that he doesn't love me as much as He does others. I have been looking for a job since 2008! I keep coming up on deadends and roadblocks. I have worked a part-time temporary job for 15 weeks during this time. I constantly struggle with this unemployment issue. My husband is on disability (on dialysis), and I need to go to work! My story is very similar to the other "Lisa" who posted on 1/25. I also have lived apart from my spouse for 5 years in another state. He is back home and we are working on it. But, BOY IS IT TOUGH. I know God led me to you. Thank you and I would love you book! This was for me today. I am plagued with negative and critical thoughts that come out of my mouth and hurt others. I don't realize I'm doing this until it's pointed out to me. Then I'm surprised! I don't even realize it. I am also plagued with worry and fear. I need lots of prayer!!! I have been struggling with worry and anxiety. There are many changes in my life right now and I am scared. God says in His word to trust Him with all your heart. Right now it is a daily battle to keep my eyes focused on Him and the truth of His Word. Today I pray that the joy of the Lord is my strength. Thank you for your ministry. I struggle with worry. Especially over finances. I also struggle with worries of acceptance & the future. I know God is in control and He will take care of me. He knows just what I need. I pray & yet I struggle with leaving the problem with Him. Julie, love how you said that prayer reroutes our thoughts. One area I struggle with is prideful thoughts. They are very unwanted and seem to come out of nowhere. In fact, it's just the enemy leaving his calling card, and I send him packing as quickly as I can. I seem to struggle with organization - I can't seem to get myself organized which then causes stress and worry because I can't let it go out of my mind. Praying that I can learn to let go and let God be in control. I struggle with sorry and insecurity; I always feel like I've ruined everything or "Look, there I go again screwing everything up . . . I can never do anything right." I focus on how much mu husband or friends must hate me or regret making me a part of their lives. It makes me an unhappy person to be around and an unhappy, broken person in general. I constantly struggle with negativity at my work. I struggle with over thinking most everything. I second guess myself. I second guess what I think God is speaking to me. I second guess who I am in Him. I really appreciated this post. Pain of the treatment of others. This practice had helped me tremendously! I know prayer works and why I don't always remember that when life woes hit I don't know. But I try to be a prayer warrior for my family and friends and after reading the comments here I have added many more to my list to pray for. Thanks Julie for providing this service for us to learn and share from and with others. Loved this! I struggle with being negative an alway re-accusing. Forgiveness is hard, but necessary. Praying revitalizes me and reminds me that no matter what, God is in control and if He is for me, who can be against me! Praying to be a happier person... and to let go of things. Thanks for the encouragement. I struggle with defeating thoughts around food. The enemy has a strong foothold there. He needs to be removed forever...and take his thoughts with him! Thank you for praying for me as I have a hard time praying for myself. I will often pray for others and situations but forget to pray for myself for strength as I am a caregiver for my mom who has dementia. I loved your devotional and plan to share it with others. I grew up as you and have found I surely need the Lord's power to overcome a critical mindset. When I read your post it seemed as if you were writing about my childhood memories! I am still struggling with the negative comments and my parents have been gone now for 15 and 4 years (each) now! Thank you for your encouraging words! OH MY SOUL needed to read the very thing you posted above. The words leaped off the page because I experience that in my current marriage. Constant words are thrown at me from my husband it it HURTS LIKE CRAZY! I never thought that I was in the wrong for the way I responded. I figured since he initiated the entire situation, why would I be at fault? I completely see my fault now. My heart has been troubled and heavy with hatred and resentment. I felt suffocated and out of control......I will start praying the prayer listed in today's email and wait patiently for my mindset to change. My daughter is battling cancer for the second time. Our prognosis is good, and we know she will be completely healed and restored. God is using our family and honoring us during this trial. However, there are times when it is very, very hard to keep fear and doubt from creeping into my heart and mind. Thank you for your prayers and for today's devotional, "Don't Yield Your Mind Turf". May God continue to bless you! You are writing about me. I've struggled with this all of my life. The harshest, meanest words however are the ones that I hurl at myself. These words are the ones that constantly replay in my head. As the record plays over and over, I become negative and harsh about everything. My husband's job has moved us to a new city and I'm struggling with seeing this in a positive light. I know I'm wasting precious time and hurting those around me with my actions. I also know the devils is sitting back laughing and feeling very successful. I signed up for your 5-day series a few weeks ago. Each one spoke to me. I've been praying constantly for deliverance from this way of life that in such a sick way seems comfortable and secure. Thank you. I'm looking forward to your book. I know it's not going to be easy to kick this habit. I know I can't do it alone. I struggle with forgiveness as well. I too grew up in a home that all that was spoken was harsh words. To this day I do not know if my father loved me. He passed on 30+ years ago. Lovingness was out of the picture. I grew up believing I could do nothing right; a combination of natural reticence and parental messages. I still tell myself I am woefully inadequate, despite indications to the contrary, a husband who loves me more than life itself, and a Heavenly Father who loves me even more than that. Loved your P31 devo today -- interesting how the Lord is giving us similar thoughts. ;) So very happy for your new book!!! Yeah! Yes, I'm here because of your (the Lord's) message today. I cried because I see my name (Julie) and I see my struggle written out in black and white. I just sent my husband an e-mail before reading this because we haven't spoken to each other for a few days, and he doesn't seemed all that concerned about it. I'm tired of the roller coaster we've been on since we've been together. It's SO HARD to be a godly wife when he's not fulfilling the role he is supposed to. I battled childhood depression and traumatic events, so negativity acts like the bad friend you shouldn't have around. The last couple of years I realized I don't know what it's like to have joy, and should be praying for it. I so desperately want to be a joyful, happy mother for my children. Okay... for my husband, too. Thank you, Lord, for your message today. WORRY...how timely your words came this morning. Just came upon your blog through Proverbs 31 Ministries. I look forward to the five days of prayer, knowing communication with God is key to inner peace. Your book would certainly be a blessing to receive. Hi Julie! Nice to meet you. I would have to say worry and a feeling of hopelessness and helplessness have a way of clouding my mind and crowding in so that I lose my focus. During trials and tests I start out strong but then I begin to succumb. It feels like I'm drowning but prayer is my lifesaver! I'm looking forward to the 5 days of Extravagant Prayer. I wrestle with the feeling of being unworthy. Then, I beat myself up for doubting what God says...which makes me dumb and incompetent. Argh. it is a rotten vicious cycle. This year, God has whispered the word Surrender in my ear....surrendering so much of what I've held on to that is not true but that I've used to define myself through the eyes of frailty and condemnation instead of God's love and freedom from all the darkness. For me it is the feeling of provision. My husband is self employed just recently had quad bypass and a stroke. Finances are always issues with us but recently have been more so. Just walked for 2 months without him getting paid but God really taught us what it is like to have Him only. But even though we have been taught another lesson. Next time I will worry about provision again! Thank you for your rich words of wisdom today. My mind perseverates upon resentment. I long for my husband to love me like I need to be loved (as if he should read my mind!). I know how foolish my thoughts often can be, but still find myself there again and again. I am looking for to Five Days of E P, P and B!! I seem to struggle with Worry the most now. It hasn't always been that, but now that I have teens, a sick ex husband, & always seem to have financial worries, my mind is stuck in worry mode. I guess its a constant battle of always something, so its always worry. Thank you for the great article and the prayers! I am really wrestling with fear right now. I have an eating disorder and my thoughts have been pretty bad lately with this issue. I feel like I am having the worst struggle with in my life. more than I've ever had in even in the past. Please pray for me. The thoughts and fears about this have been overwhelming; also with a lot of anxiety. My heart aches as I wallow in the pain of my unmet expectations of others. My mind schemes of ways that I can control other people instead of considering how I can control my own thoughts and actions. I desperately have been praying for the freedom you describe and the self-control I desire. I think too much...always have...probably always will. Your words really speak to me and remind me of myself. The only thing truly happy in my marriage is our child and as she gets older, I often wonder how our unhappiness is affecting her. I try not to but I replay negative words spoken to me over in my mind way too much. Even though I know it's not true, I struggle with thinking that I don't deserve to have a happy marriage because of some things I did before I became a Christian. I pray for our marriage but still feel most of the time like my husband hates me and wonder if my bitter thoughts toward him will ever truly change. We have a hard time communicating and I am a peacemaker so I usually don't say anything at all rather than go through more drama with him. I know God put us together so I know this is not the way He intends for it to be but it seems like it will take a real miracle for us to find true happiness and joy with each other. I feel "stuck". I struggle with doubt- I pray for God to speak to me and when he does, I wonder if I am really hearing Him or if it is just me. I know this is a strange reaction...but what a blessing it was to have read all of these posts. As I read...and prayed...through each one, my feelings of connection grew. We are not alone. I am not alone. This is so me! I am learning how to let things go and trying to focus on seeing myself as God sees me. Julie....thank you for this. Sometimes I just can't stop the replay button in my mind, like a never-ending hamster wheel, I keep going over and over the day's worry. I need also to forgive a family member for past hurts. Such a great & timely devotion & post (I got here through today's Proverbs 31 Ministry devotion). I have struggled in the past with all sorts of deceptive & destructive thought processes. I regularly have to remind myself to thank God for delivering me from these thoughts & to keep filling my mind with His truths. Loved this post! It seems the bottom line is our minds are either yielded to the world/flesh and all that entails or God. And it's our choice, isn't it? I am such a firm believer in praying for ourselves...and have met so many who are uncomfortable with this. Oh my I so need prayer!!! Unresolved anger and feelings of rejection undermine my confidence. I think that I am 'over it' and then something happens to triggers the feelings of betrayal once again. It's like a never ending cycle. I was raised in a quiet home. My parents didn't fuss due to the fact my mother kept the peace and allowed my father to do as he pleased - hunting, fishing, etc. but I raised my children with a verbally abusive husband who is still a lot that way. I was and am not like my humble mother so I dished out when he dished out. The Lord saved me truly as an adult and took all the argutiveness away but it is hard to not lash back even now. I question his salvation even though he says he was saved as a child. One child broke the mold-the other did not. It breaks my heart to see what we did to them. Even the grandchildren picked it up. I have to constantly pray for God to bridle my tongue but even then it is hard. Both of my children were raised in church but either go now. Pray that I can be the example I need to be for them and my grandchldren. I struggle with criticism and comparison - I'm not good enough, not doing enough, should be a better Mom, better wife, in better shape, with a cleaner house. What an exhausting stealer of joy! I have been struggling with a negative mind set for years. Like you, I grew up in a house with nothing but harsh words being said. I would see my mother cry all the time and I swore to myself that I would never put myself in a situation like hers, but I did. My marriage is the same. My husband's harsh words and actions are mentally and physically destroying me. I faced a lot of rejection from my own family when I was young and now him. I even thought that God didnt love me, how could He...I'm not perfect. I do praise God though now I am coming to understand His love for me but its still a struggle. My husband has done and said a lot of hurtful things and its so hard to show him love like I should. The enemy beats me up everyday with negative thoughts and depression. Im trying so hard to break free. Very interesting post since it makes me think of my husband instead of me. Hmm about that board in my eye. However, I see a need for prayer to be able to stay strong in my typically more positive outlook while it appears that my husband is becoming more and more critical as he ages. This post definitely provides me with a better focal point as to what I need to do as I continue in my path of following Jesus's example and love my husband. In the last couple years, I have found myself in a battle, seemingly, for my life. Not long ago, I began experiencing issues which some believe may be attributed to menopause and stress (extreme hair loss; on-going, horribly itchy skin condition w/awful rash on face/ears, which has yet to be diagnosed; excitability and much anxiety). I have also been struggling financially due to being unemployed for over a year now; even after diligently seeking work, I continue to receive rejection after rejection. Although my faith that the Lord will move on my behalf has been, a few times, "hanging by a thread", it has mostly abound!! However, the joy and peace that I read about, and I know I should have as a christian woman... they are not there, and I find myself constantly fighting against depression, and daily trying to pick myself up by the bootstraps. I know that we should all consider ourselves pilgrims, and should be watching and waiting for the day we can leave this earth and go to the place called "home". However, I am a tortured, tormented soul, and I often ask the Lord to lighten this heavy burden that I carry, or remove me from this life. I don't think this is normal, or the way God would have us live. I have begun asking Him to open the eyes of my mind so that I may discern why He is allowing this to happen to me, or what it is that He wants me to learn from what I am experiencing. The Lord continues to remain silent, and I continue to suffer. I have not given up HOPE, although I feel that it is very possible that the Lord might, perhaps, choose to heal my life through my death, as this is really how terrible things have become for me. I wouldn't mind this, because "for me to die will be gain". Please pray for me. Thank you, and God bless you for your ministry. My struggle is with not feeling like I am good enough. I have had 2 failed marriages & at 53 am not really into the dating scene & so I have an attraction to a friend that I have known for about 20 yrs & he has never let anyone into his personal space & I have totally fallen in love with his whole family & now they all have accepted me as "family" but he only looks at us a a great friendship when infact I have deep feelings for him & he has them for me, so I am feeling somewhat rejected b/c he does not want to move this into a relationship & so I keep beating myself up asking what is wrong with me & so my emotions are on a major roller coaster & I need to not spend so much time or effort on this situation & just try to enjoy life. My friend just won't deal with his feelings so he ignores them & that drives me totally crazy. I just never thought at age 53 that I would have 2 failed marriages & be alone. But I have total faith that God has a better/greater plan for me & I have to believe in myself. As a new subscriber to Proverbs 31 emails I happened to come across your blog. It never stops amazing me what God puts in front of you just when you need it! I am constantly struggling with trying to "remove the splinter" of harsh words in my adult life and the ones left from when I was growing up. I can totally relate to your story as mine is much the same. Thank you for showing me that I can move past these hurts if I only pray and forgive and let them go instead of letting them fester. negative feelings toward me just linger and linger and I try to talk it out but they continue pounding me. Please pray for me, I was just reading this and saying, My GOD how does she know. This is always been a difficult task for me to get over. Wonderful post and wonderful blog on proverbs31 ministries! One of the most difficult battles in my mind is when I feel judged or criticized by others. I can create entire scenarios with my assumptions of how others view me...and it's usually not the positive views of me. What if I used all of that energy to pray for them, for me? And, what if I used all of those creative juices in my mind/imagination to envision God's best for others, for me, my husband, and children? Wow...we do battle in the mind. Thanks for the encouragement! I struggle with guilt and selfishness. I left a destructive marriage, and I felt I had valid reasons. God did not design marriage to be a abusive relationship...but it has been so painful for my kids. I now feel selfish, yet I was praying to God to take one of us home because I couldn't take life with him anymore. I struggle with insecurity, years of critism from my x-husband have scared my heart. I'm glad there are real women with practical advice and a plan of action. I've been praying for the chains of generational sins to be broken in my family and healing to come in an overwhelming fashion. I know my husband loves me and he takes care of me, but I am needing encouragement and he is always "instructing" me, his words. It doesn't feel loving so I resist even more. I need to know how to lovingly respond. 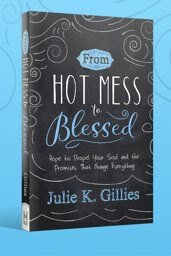 Julie, what an awesome post and P31 devotional. I am trying to absorb into my soul (not just keep as head knowledge) the truth that our circumstances do not need to define us. We can be hopeful despite our emotions and the feeling the world is falling apart around us. Since my mother died nearly two years ago and my father had a stroke this fall (both in their 50s), I've struggled against selfishness but have been growing as I learn to align my agenda with the Lord's. I am the mom and primary caregiver of a son with a form of muscular dystrophy and epilepsy. I struggle daily with isolation and I am embarrassed to admit a bit of resentment. I can see how satan uses the isolation to spin my thoughts in very unproductive ways. Thank you for your reminder to use prayer as a weapon to battle these thoughts. I'm struggling with fear. I'm currently unemployed and having a difficult time. After submitting well over 150 resumes, I haven't been invited to a single interview. Since selecting the word TRUST as my focus word for 2013 and reading the Bible every day, my anxiety has drastically decreased. However, there are moments when I'm still afraid. Thank you for the opportunity to win a copy of your book! Your devotion today spoke directly to me! My marriage isn't so great, and just this morning I was struggling with why I should treat my husband well and allow him to believe he's a good husband when I don't feel he is. How sad is that? You've helped me to realize that I need to focus on my prayer life. Thank you! Julie, thank you for your blog today. In my busy day to day existence I forget to take a step back and take time for reflective prayer. I am looking forward to the 5 days purposeful Extravagant Prayer. I’d love to win a copy of your book to help me continue after the 5 days. Trust vs fear is the battle I'm facing too. God's SHOWN Himself faithful. I need to completely surrender. Thank you for the reminder to pray for OURSELVES! Most of my negative thoughts are directed toward myself. I realize that this stems from perfectionism and thinking,"This or that would be different if I had just...." As I learn more about God's grace, I remind myself that He accepts me as I am. I am not in control of the outcome, HE determines it. I look forward to the 5 days of Extravagant Prayer to renew the daily quiet time I have been neglecting. As I face the fact that I have not been working since October since I lost my job, the enemy is constantly telling me that I will never find a job and will not be able to pay my bills. I am also noticing a feeling in my left breast lately that I have never noticed before and are concerned about not having insurance to go to the doctor to check this out. I am quietly going out of my mind with worry and fear. Thank you for your encouraging words. This ministry is what keeps me going each day with these inspiring and hopeful stories which continually lift me up. God Bless.. I've battling with personal struggles is trying to be people pleaser and letting my guard down. The verse Romans 12:2 spoke to me today because of all these negative habits (gossiping, talking down on people,judging) that the world are trying to pursue me in. Also thank you reminding me that all we can and MUST do is have a intimate conversion with God; the mind is weak but the holy spirit is stronger. When i read parts of the book,it felt like God was talking to me through you.i struggle with letting go of everything.i unclutter,rebuke negativity.its hard letting go of control when you have an abusive past..loss of a child,surgeries and a present relationship i believe was heaven sent,but feeling lonely,scared,as we are to wait on a sign from god. "He will quiet us with his love".a verse i pray always. I am a thinker. In fact, 4 of my top 5 strengths from the Gallup Strength Finder are in the Thinking category! I spend a lot of time in my head. While that has certain advantages, it has a dark side too. I struggle a lot with insecurity and fear, which holds me back from taking the actions and steps I need to move forward. 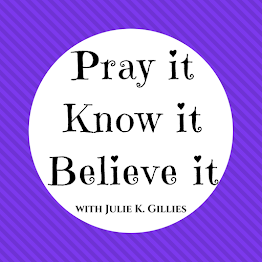 Julie, I loved your P31 blog today and your post here. I need to use prayer to re-route my thoughts. Looking forward to the 5 Days of Extravagant Prayer. I am having problems with my oldest dealing with yelling,arguing, being negative all the time and blaming everyone around her except herself. She is making everyone around her not wanting to live with her. My younger children are scared of her. I am doing a bit of soul searching lately, which always seems to happen when I am overwhelmed with anxiety and unhappiness. Your devotion today at Proverbs 31 has to have been God speaking to me through you! Thank you so very much for this devotion today. It was truly exactly what I needed to read today. Several years ago, I was treated very negatively by my co-workers. Today, that experience has haunted my thoughts as I have replayed it over and over again in my mind. Thank you for helping me to let it go and to turn it over to God. Thank you for praying for us and encouraging these beautiful sisters too share. I am struggling with holding my tongue and speaking when I should be listening. I really enjoyed your post on Proverbs 31 and on your site. You wrote about a subject with which I have been struggling. I have negative thoughts about myself. They can make me freeze and not do anything. Throughout last year, I was going through some very difficult times. Actually, I still am. Because of these difficulties, both at work and in my marriage, I now suffer from a complete lack of self confidence. I know that I can do anything and that I'm not damaged...but it can be hard to remember that. I really appreciate your words and your prayers. I struggle with self defeating thought, it never seems to matter how little or how big the moment, instead of cheering myself on, I am telling myself that I shouldn't continue because I will fail anyway. The one area I really need work on is being compassionate. When people share their concerns and struggles with me, I feel like saying "Bounce back-it's not that big a deal!" I pray that the Lord will soften my heart to others and help me to see their struggles and realize that what may be a struggle to me might not be a struggle for someone else. I look forward to reading more of your postings. I thank the Lord for you and the spiritual gift of writing He's given you! I am so excited about your book! Self defeating thoughts can consume me and i struggle with looking at the positive when i grew up in a family that always finds the negative. For months, I've been struggling with words and deeds that have been brought against me. I've even contemplated leaving a ministry that I'm passioned about because of this person. It was by no mistake that I'm reading this today. I've been asking God to show me His ways and yours words have begun the journary...thank you! Your devotional spoke to my heart. Like you I grew up in a critical, negative environment. My belief that I did not matter led me into the hands of a man I trusted that sexually abused me for 4 years. Destructive thoughts were stacked up in every corner of my mind like dusty books in a used book store. It has taken the last 23 years of recovery to clean out the dark crevices of my mind and retrain my thoughts. But I still struggle with most relationships .....always questioning what people really mean,wondering what they think of me. I work on my damaged heart constantly and it takes great effort to keep my thoughts from going to a dark place. Even though I have a caring husband, he cannot please me and I am very unhappy in my marriage. I need him to be more considerate of my needs but instead of telling him I walk around and harbor bad thoughts, which leads me back to old habits of ruminating incessantly about my unhappy place in life and a painful past. I am trying desperately to counteract all negative thoughts with a prayer to break these habits. Thank you for sharing this wisdom! I struggle constantly with self esteem and and a sense of.. lacking. I am never a good enough wife, mother, employee.. I don't have enough time, money, knowledge, patience, strength... The words of mother & grandmother,"you'd be so pretty if you'd stop eating".. Prayer is the gift He gives! Julie, thank you for the post about a negative mindset. I didn't realize just how negative I was being in my thoughts and responses until I had read another P31 devotion recently. Now I am more aware of what I am thinking and saying and I constantly pray about being more positive, especially in response to someone else who may have just paid me a compliment. I enjoyed your post. Thank you and God bless. I struggle with reliving negative thoughts and words daily. It is so easy to keep rehashing. Thank you for your post, I will keep this one close by and refer back to it often. Thank you! My struggle is with insensitive people who assume you are financially all set since you are retired. How many times I have had people ask me, "Well, are you going to become world travelers?" or "you should buy.......you won't be sorry you did." or "You mean you can't go on the Parish trip to France next October? Why??" Then I sometimes wonder...."Why did God choose this life of austerity for us? Am I not worthy to have what others have?" Is His reasoning so far above mine, that I cannot grasp His message? My struggle is being able to drive again! I no longer have a license because it expired while I was in rehab recovering from a Brain Injury in 2007 so it has been over 5 years! I have just started to get the thought of driving in my mind & finding what All I have to do & it All scares me very much. I have a hard time not rehashing negative thoughts and feelings and thinking of things I could have said but know I should'nt! Julie, your post this morning spoke volumes to me; the comparison between my thoughts and a splinter was so accurate. I struggle with perfectionism which leads to thoughts of comparison which leads to struggling with thoughts of doubt and insecurity and often has me in a works-related spin to be good enough, or feel worthy enought; my husband and my children don't ask or require these things of me, there is just something internal, ingrained in me from my childhood that pushes me to constantly strive to reach a place of being enough by my definition. I just never seem to be able to accept myself as I am. Well, I struggle with angry words especially when tired or hungry. I would really like to win your book! Martha T.
Julie, my battle has always been in my mind. I struggle with remembering EVERY bad and ugly offense against me but not being able to recall the GOOD things that have happened in my lifetime. Pray that I can let go of the battle in my mind and forgive people who have trespassed against me, so my heavenly Father will also forgive me. I want to be able to let go of the BAD memories and recall ONLY the GOOD! Thank you for your post. Julie my struggles are withmyself because i feel that i do not know God as well as i should.I ask for clearty to learn to know him better this is a battle i have had for all my life I know he is here with me everyday but i can not feel him as i should.Please pray for and with me to understald what i am missing. My struggle is with being good enough. I know that I am God's creation and uniquely made. I desire to let go of those negative thoughts and focus on the positive! I struggle the most with being a people pleaser and my second younger sister hating me. I am always worried about what others think and how they will feel if i say no or I cant do it this time. I would love to get the chance to read your book. Thanks for your words! I struggle with negative thoughts, mostly about myself. But that tends to spill over to others as well. There are so many areas i struggle with but not being enough is the biggest fear i have. Not being a good enough wife, not a good enough mom, not a good enough worker, in general just not good enough. The feeling is crippling. I hate feeling that there 's possibly someone that could take my place and do better. I am always putting others ahead of myself - seldom do I remember to pray for me. Ahhh, Julie, congrats on your book!!! I love the cover, too. Can't wait to read it. I think not measuring up to whoever's standard is my biggest thing right now. I'm so excited to see your book! Yay! I first heard about you through a "Encouragement for Today" from Biblegateway just yesterday. When I read your story and how you described your struggles on letting go of anger and hurt from others and how we can allow for those hurtful things to play over and over in your mind which inturn can cause us to respond back in the same, I thought wow this is exactly how I feel. I am going through a rough time myself in my marriage, hurtful things are said and I resent my husband for so many things. Like you I am looking for peace and I want to just let go and live my life as a good example for my children. I know that the way I deal with my current circumstances is going to affect them in so many ways and I want to be a good role model. Tommorow I will be going to church for the first time in a long time. I feel this is the first step to take in order to find that peace & strength that only God can give me and my children. I am glad I found your blog. Thank you. I am retired and now in my seventies. Sometimes I still struggle with my thoughts. My husband would often comment that I am negative; maybe I am of little faith. I struggle now with the thought what would my grandchildren become when they grow up. Because I see that the parents are not reading the Bible with them and they go to a church now of different faith. I know have to commit them to God in prayer. Thanks for your post. I do love to have your book. I am a pastor's wife. We have recently left our church and the memories of what has been said to me runs through my mind often, knowing that I have had many mean things said to me over the years and the Lord and time has healed me to forget and forgive, but in the immediate moment, it is so hard to have the ones that I thought were my friends and comrades in the faith, preaching and sharing the Lord with the unsaved, have become my enemy. my battlefield is definitely my mind, my Pastor has said that 99% of spirital warfare is in your head. I will say that this message has come at a time when I really need it, i had a situation that happened with a friend of mine, and i thought i was alright with it but lately i have been replaying certain things she said in my mind over and over again, and it has been getting to me because it interferes with my relationship with the Lord because I know it doesnt please Him, and how can i pray if i am harboring these thoughts in my mind, and then the Lord directed me to your article, and it has really been a help to me, now realizing that replaying hurtful situatiuons makes it hard to forgive, and you are so right meditating on critical thoughts makes you extremely un happy, and i really like how you said that critical thoughts spread like weeds in our minds and will even choke out positive thoughts, oh yeah my Pastors right and you even back up that thought, the enemy's plan is to consistently assault our minds. I have printed the last part of your article so I can put it on my fridge soeveryday I can reflect on the questions and meditate on the verses and now I also have a specific way to pray for my mind. thank you very much!!! I am a new reader here; I just went to the Proverbs 31 Ministry page and it happen to be your devotion about negative thinking and I was really touched by your great testimony. I clicked on your page and it brought me here and I am being blessed by reading your devotionals. I felt I needed to get the Word of God in my mind this morning. Sundays are very hectic around here with overnight shifts and then coming home to take care of the family and today I have guests and I feel negative attitude coming to visit. Being a pastor's wife does take its toll on us wives. But your words this morning have refreshed my soul. Thank You. I have been reading the proverbs site almost daily and each day I know it's because God wants me to see the reading. Thank you for your post. I think negatively a lot and one friend ( who has stuck by) has even told me that I do. I'm working on becoming more aware of my thoughts and actions but it has been hard. My upbringing was not an easy one and it was always filled with anger, fear and hurtful words. I am a new mom and don't want my daughter to ever feel this way so I am trying to change my way of thinking and looking at myself. I was never taught that I was important, but as I am searching to find my way I see it starts with me! Thank you for your devotional words today. Those words spoke to me as I know God is using various ways to give me the same message. I have struggled with a pattern of negative thinking most of my life. I have never been an optimist. I see what things can happen. This has often caused a strain with my optimist husband. However, we moved to Mexico four years ago as missionaries and there are new stresses and "things that could go wrong" that come to my mind. I know worrying and negative thinking is sin but I cannot seem to shake it. I don't want to turn into a "crabby old lady." Now I'm having health problems that don't have answers yet. I have another test tomorrow, so your words were timely for me today. Thank you for being used by the Lord. Blessings to you. I am new here am feel so blessed to have stumbled across this site. I have been plagued with negative thoughts my whole life. I struggle with panic, anxiety and depression and feel so overwhelmed by everything going on in my mind. Your words helped me to realize that God is in control and if I will just trust him and seek his guidance through prayer and daily scripture I can change my negative way of thinking. I have three scriptures on my fridge that I read every morning. They are not prayers for me but scripture to remind me what God will do for me when I am feeling overwhelmed. I am excited to add to these praying for myself. I am also excited to have you help me do it in a positive way. I have been selfish in the past and am very cautious to not be that now. I love getting Proverbs 31 Devotionals every day and I am glad I took the oportunity to hook up with you. I struggle to die daily to self doubt. I feel as if I must work hard, do more & be better to be LOVED by God (or anyone else). I do & give because I love it, but do reset when I need care & "pampering" or encouragement, it appears to not be noticed (those SATAN GLASSES can change the view of what I KNOW to be real!!). I am a work in progress & am so thankful for MERCY & GRACE--I just need to learn to accept the FREE gift!!! Iam struggling with being married. My desire is to be a better christain. I can do that with GODS help. But i cannot do it for my husband, he needs to do it on his own with GOD. I have always been the type of person that just keeps it real. I say what's on my mind. Although that can be a good thing, if my words aren't seasoned with heart, it can be hurtful. I have come a long way in this area but I still have so much farther to go. After reading several comments, it's apparent to me that a lot of us struggle with negative thoughts that come from past experiences. I know that God is with me and he forgives me, and he just wants me to have faith in Him, and I do, but the fear/feeling of not measuring up steals my joy. Thank you for sharing your experiences and your faith with us. I think I have moved forward and am doing better, but it is a daily process. It helps me to know that I am not alone, and that there is hope! I just want to try each day to do a little more, to be a little bit better. I struggle in my marriage and when I read your post, that was me. Critical all of the time toward my husband because he's not what I think he should be in his Christian walk. I've asked the Lord to help me, but I know I need to read the Word more and pray more. Thanks for sharing your experience because it helped me see myself. I love my husband and I don't want to be critical all of the time. Keep me in prayer. I am struggling with a lot of negativity right now. When I read the Proverb 31 passage today it really hit home for me. The things I'm dealing with are my conviction that I've been saved, depression with my job, and the fact that some people really think I'm incapable of doing things and getting things done because I have a hearing impairement?!!!!! I try hard not to be dependent on other people and not afraid to ask for help if I need it. I'm tired of being judged. I've been praying to God for guidance. Seeing today's passage really hit home for me and I will pray using this prayer. I struggle with knowing how and when to stand up for myself -so I usually don't. I have been asking God to renew me from the inside out. All my life I have had resentment and sarcasm nad meanness as my protection. I have always wanted to be gentle and kind and I had almost given up on God being able to change me until I read your web-site - The Lord led me there and I am finding that GOD can change me - after all these years I have hope again. Wow! How timely this was for me! Being raised in a very dysfunctional home, followed by years in an abusive church has left me with some painful splinter-words. The theme surrounding these words is that I don't measure up, am not good enough, and thus, deserve/expect rejection. Recently I have faced a new episode that has brought all these words/thoughts to the forefront. I'm trusting in prayer to break these mindsets and end the enemy's assault on my mind! Thank you for getting the ball rolling in the right direction for me. Your new book sounds perfectly fitting for my life! Can't wait to read it!! I grew up in a home where whoever could think of the meanest, most sarcastic, hurtful words WON! I couldn't wait to leave home, marry a man as unlike my father as possible, and have a great "rest of my life." Unfortunately, when my husband turned out to be EXACTLY like my father, I didn't have the spiritual maturity or the depth of character to not turn into my bitter, unforgiving mother. Thirty-two years later, we are barely tolerating each other, and worst of all, our children have no respect for either of us. In other words, they feel about us the same way I felt about my parents. Every day I ask God to take my life, because it's been such a waste. I have little hope that the cycle will ever be broken, and my heart is grieved for the pain my children are going to endure because of me. Maybe your book will minister to them before it's too late. What a refreshing treasure to find a Christian woman who understands the battle of negativity! 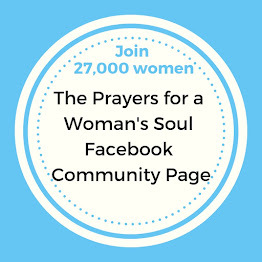 It's such a crippling reality and if we don't have the right tools to battle this war of our minds, we get swallowed into a very, deep, black hole; EVEN THOUGH WE ARE CHRISTIAN WOMEN! Thank-you for showing me that there is a different way to view and rid myself of the negative remarks that have deeply wedged in my soul for so many years. I know that I have become extra-sensitive because of the the way these jabs (that I have heard towards myself pretty much all of my life) continue to make me feel about myself. I have prayed, but not in the same way that you have suggested in your posting for Proverbs 31 Ministries. I would love to read more in your book. We are overcomers in Christ, I know, and the Bible is all about teaching us how to do this; but sometimes it takes another person to share the tools to help us find the answer. I am new to Proverbs 31, but I will continue to read your blog as well. I can't really explain to you how much encouragement you have given me, in just this first devotion! Thank-you so much for giving me hope that I can break free from the way that this negative thought process has kept me from becoming the woman that I know God wants me to be. This devotion seemed like it was written just for me. I too have distructive thoughts and behaviors from being raised in a home filled with anger, resentment, double-standards, and critical words. I want to badly to move past this pain. I have a great husband and two great daughters, but sometimes I allow the past to hender me. I definitely want to get your book. It is great how God works because I had just said to myself this morning..."Why am I still thinking about things that happened years ago that I cannot change? I need to let these go!" I have struggled in an unhappy marriage for about 15 years. I try so hard to pray for guidance and to help me understand why my husband and I have such a toxic relationship. Tomorrow (january 29) is my 64th birthday and I am hoping for a gift box filled with peace of mind, understanding and patience to come! Knowing that won't happen, perhaps your prayers, added to mine, will bring about a change in me to lead a better life. I constantly struggle with feeling inadequate, always wanting to.please people, always searching for acceptance. I have often been told i don't have a backbone and need to stand up for myself. Living in an emotionally abusive marriage for 20 years did not help. It has left me feeling insecure and very depressed. I read scripture every day and am reminded that i should not fear because God is with me and loves me unconditionally. Having a really hard time of letting go of my insecurities, it is a constant struggle but i recognize it and am working on it. Thank you for your blog, it has been a big help. God bless you for what you do for others. Oh boy, I think every single sentence you mentioned described me. It is such a struggle. So good to know that I am not alone. Misery loves company, although I'd rather not be miserable! I appreciated reading all the comments too. I will be a regular follower of you blog and will get your book. case and thought i'll share it together with you. WOW - What a message for my mind and more importantly, my heart! Lord, I pray that You would take my mind thoughts (and the attitudes of my heart) and take them captive. Cause them to obey You and to glorify You.